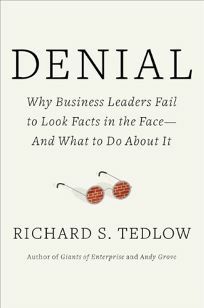 Author and Harvard business administration professor Tedlow (Andy Grove: The Life and Times of an American Business Icon) asserts that ""denial goes hand-in-hand with short-term thinking,"" a problem that arises when a business ""that once might have focused on getting the job done now is concerned with getting done with the job."" The history of industry is rich with such cases, a number of which Tedlow examines with thorough understanding of both business and psychology: the initial brilliance of Henry Ford&apos;s Model T assembly lines gave way to significant setbacks when they failed to take the threat of Europe&apos;s radial tires seriously; the ""great"" grocery chain A&P was sunk by executives who ""celebrated the statistics they liked."" Tedlow also surveys the ""edifice complex,"" in which struggling but respected companies erect monuments to themselves (like the Sears Tower) rather than tackling real challenges. Contrasting successes include tenacious DuPont, Intel&apos;s chief truth-seeker Andy Grove, and Johnson & Johnson, which faced almost insurmountable challenges head-on during the toxic Tylenol crisis. Tedlow discusses ways to overcome the denial inherent to human nature as well as the institutional variety, cautioning against ""yes"" men, the vocabulary of euphemisms, and trash-talking the competition: ""What am I using this derision to hide-perhaps from myself?""